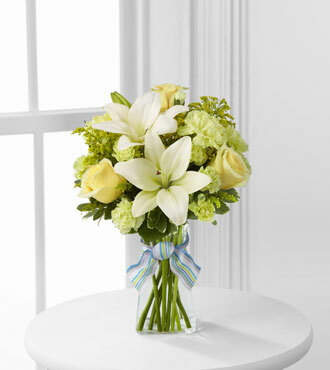 Congratulate a loved one on the birth of a new baby boy with a special flower arrangement. This bouquet includes roses, carnations and lilies combined together into a kaleidoscope of soft yellows, greens, and white. Just like a warm breeze at the beginning of summer, the FTD® Boy-Oh-Boy™ Bouquet offers a message of congrats for a bright new beginning. This gift is florist arranged and available for same-day delivery.